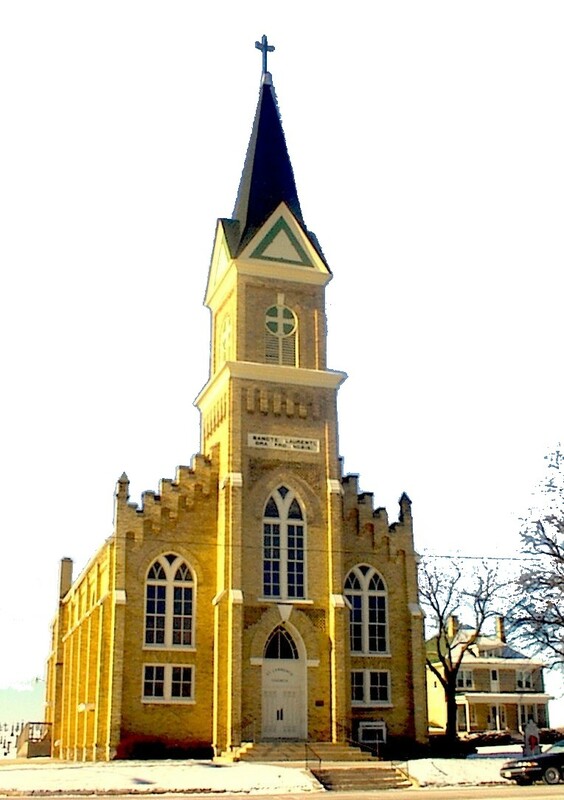 Immigrants from the Chodsko region of the province of Bohemia, in the Czech Republic, founded the Church of St. Lawrence in 1864. The first Church was made of logs with a cedar shingle roof and was built on the spot where several Bohemian workers were miraculously spared from harm even though a large tree was accidentally dropped on them by road workers. The current Church building was started in 1892 and completed in 1894. The parish rectory was completed in 1905. These Bohemian settlers were low-income farm workers, however they felt the need to have a magnificent Church to celebrate their Catholic faith. The Church was built for $15,000, an enormous sum in those times. The veneration of St Lawrence was common in the Bohemian culture since the battle of Augsburg which occurred on August 10, 955 (the Feast Day of St. Lawrence) when many young Bohemian men died in fighting the German forces of Otto I. The Bohemians have commemorated that special day ever since. For further veneration, Prince Vratislaus in the 13th century brought several relics of St. Lawrence to Bohemia. The Chodsko region of Bohemia (the highland region around Domazlice) was the home of the Stangelville immigrants and many had worshiped at the Church in Mrakov. It was only natural that these immigrants would build a Church in the name of St. Lawrence in their new homeland. The church was built in the 19th Century Victorian Gothic design. It includes a side chapel that has a hand-carved altar designed and crafted by one of the early Bohemian pastors, Father Adalbert Cipin, in 1875. The steeple, with its large bells, reaches a height of 150 feet. The church is 50 wide and 100 feet long while the arched sidewalls are 22 feet high and rise to the peak of the ceiling at a height of 35 feet. The 14 exquisite stained glass windows (over 15 feet tall) all depict spiritual figures. The gifted wood carver, Joseph Svoboda of Kewaunee, crafted the three ornate high Gothic altars out of native oak and butternut. The side altars are over 20 tall, while the main altar rises to the height of 32 feet. Milwaukee artisan Louis Shrovnal refurbished and enhanced the 10 beautiful ceiling murals and other ornate artwork in 1957. Several statues and other church furnishings reflecting their Bohemian roots were added over the years. The church is a testament to the faith and fortitude of these Bohemian immigrants. © 2008, The Friends of St. Lawrence, Inc.